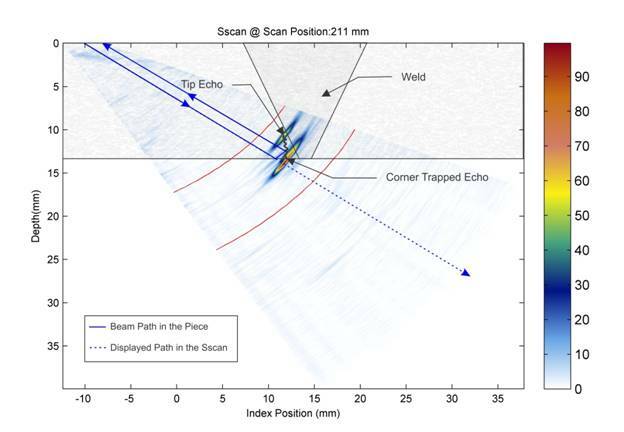 Two-dimensional sector-scan image of a flaw inside a girth weld linking two large sections of an oil pipeline. Blue lines designate path of ultrasound; the two coloured echoes represent ultrasonic pulses diffracted from the top and bottom extremities of the weld defect. This particular flaw is approximately 3 mm in depth emanating from the weld root (inner wall of pipeline). Welcome to new graduate student John Sun. Manuscript accepted for publication in Ultrasound in Medicine and Biology, with PhD student Ehsan Jafarzadeh first author. Presentations made at Annual Conference of Canadian Institute of NDE by Fatemeh Karimi, Samaneh Hoseeigngholizadeh, Yixin Liu, Ibrahim Assi, and Neelesh Bhadwal. NSERC CRD award, “Ultrasonic nondestructive evaluation of welds in clad piping systems”, in collaboration with Olympus NDT Canada. Welcome to new graduate students Ibrahim Assi, Neelesh Bhadwal, and Yixin Liu. Congratulations to Chris Bosyj for successful completion of his MASc program, in collaboration with industrial sponsor AMAG Ltd.
Congratulations to Chi-Hang Kwan for successful completion of his PhD program, in collaboration with industrial sponsor Olympus NDT.